1. Have your employee identify themselves as working for an ORACCA member company and receive the special pricing. 2. The Thermal counter staff will verify membership through a list supplied by ORACCA. 3. Receive the discounted price, regardless of it being a cash transaction or company charge. At this point we will only be offering the preferred pricing on Hilmor tools. There is potential to expand depending on the success of the program. Every technician needs the proper tools to perform their jobs, so ORACCA has a new member benefit for member technicians. Thermal Supply and Hilmor Tools have made arrangements to give ORACCA members, the company and their employees, an additional discount off their normal price. 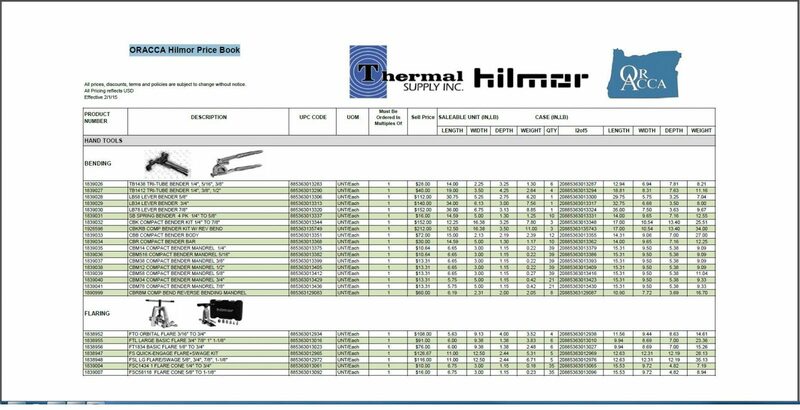 This means that ORACCA members and their employees needing tools can identify themselves as members and automatically receive a better price on the amazing line of Hilmor tools at any Thermal Supply Branch, in Oregon or SW Washington. For the Contractors and their employees it’s as simple as following the above three steps. Hilmor has a rather robust collection of more than 170 HVAC/R products, and span five core technical categories including Pliers, Wrenches and Wire Strippers, Snips and Sheet Metal and Duct Tools, Screw driving and Tool Storage and Transport. Pliers, Wrenches and Wire Strippers: Hilmor’s family of pliers, wrenches and wire shippers give technicians the tools they can depend on and use in almost any situation, on any job, no matter the difficulty. This year, Hilmar introduced 24 new essentials to the line, including the Quick-Adjusting Tongue and Groove Plier, which simplifies grabbing ahold of hex, square or round fasteners while the jaw quickly adjusts with the press of a button.